Greetings, traveller! 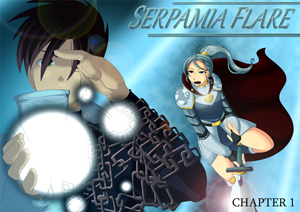 Welcome to Serpamia Flare, a fantasy webcomic! Where to begin? Here are 7 basic things that are useful to know, before you embark on your journey. #1: The first chapter starts here! 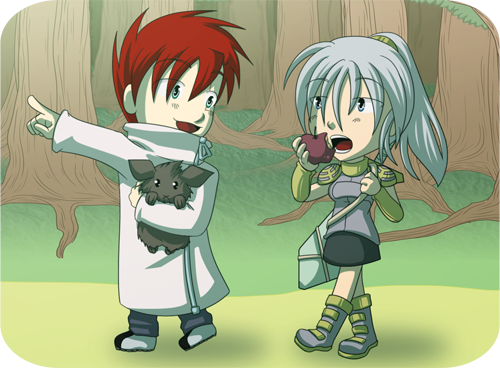 I redrew the first part of this chapter, but some of the art is still old. It becomes consistent starting from Chapter Two, though! #2: You can save the page you're reading and load it up again later. #3: All the comic pages have alt-text. What this means is if you hover your mouse over the comic page, you'll see some floating text. It's not necessary by any means, but it's there if you want to see what random cheeky comments I have to make. : On some mobile devices, you can catch the alt-text by pressing down on the image and waiting for the menu to pop up. Just a tip for you to try! #4: There is a synopsis for every chapter, save for the latest. If you prefer to read from the latest chapter without reading through the earlier ones, you can refer to the handy synopses guide and get a spoilertastic summary of every chapter there. : You can also take a look at the archive if you're looking for a specific page or chapter. #5: This webcomic updates on Mondays and Thursdays. To follow updates on Serpamia Flare, you can add this to your RSS feed or you can also follow SF on Twitter or Facebook. When a new page is up, a Tweet/post will come up in your notifications! : If you notice a page isn't up when it should be, you can get an update on either Twitter or Facebook to see what's going on and how long the delay is expected to be. The strip takes a break on the last Monday of every month. : SF tends to update at 18:00 +8 UTC on the dot. #6: You don't have to have a ComicFury account to leave comments, but you do need one to subscribe. Another way to keep up with updates on SF is to subscribe with a ComicFury account and check the Subscriptions tab there. I highly recommend other ComicFury webcomics (on the links page!) but you do not need to have one to leave comments. If you want an avatar, though, and notifications as to when people have responded to your comments, you'll want to make an account! : It is possible to follow Serpamia Flare on a mirror - please check the Links page out for mirror links! #7: There is a forum for Serpamia Flare that is open to role-playing and other discussions. If you would like to be a part of the community and discuss things with other readers, please feel free to take part in our forums. Discussions are not restricted to only Serpamia Flare - in fact, you are free to discuss pretty much anything - plus we have Nemicons and RPs Reading the threads are open to non-members as well, if you just want to lurk, so come on in! : Also note that this is also where I frequently update the WIP shot thread with WIP shots of the next update to come, and readers caption them for fun. Feel free to join in! What kind of newbie am I?